Throughout this year, many analysts have focused on the price of Gold, Platinum & Silver markets for insight to the fear levels that exist in the global markets. Demand for Gold and Silver have been near historically high levels for the past 12+ months and the ratio of Gold to Silver has continued to show that Silver is extremely undervalued in relative value to Gold. We’ve highlighted these facts in previous articles to our readers. The recent news regarding economic and political concerns regarding a wide range of Emerging Markets and established economies, we believe, has continued to drive upward price pressures in the precious metals markets. We feel the Metals & Miners are setting up a unique opportunity for patient and skilled traders/investors. Possibly, the opportunity of a lifetime if our analysis is correct. Near the end of 2015, NUGT was setting up a congested wedge formation, that lasted 7 months, with clear support near $20. This pennant formation retested support over 6 times before a “wash-out low” price pattern formed as price attempted the eventual breakout. These types of “wash-out” patterns are common as price begins to accelerate into new trends. Washout lows tend to flush out stops and positions from traders that have their stops too tight for the markets. In this manner, the market is rotating in a matter to reaffirm support before the new bullish trend extends. Notice how quickly price expanded in this uptrend and how price moved above the $30 level in just a week before continuing well above the $120 level. We are illustrating the explosive capabilities of a congestion trade setup like this – well over 500% from the $20 support level. Take a look at a current 2018 NUGT chart (below) and please pay very close attention to the similarities between these two charts. We can’t stress how important it is to understand the opportunity we are showing you today with regards to these patterns and the potential for traders to take advantage of this setup. The current price pattern setting up in NUGT is another congested wedge formation with support near $22. This pattern has been setting up in the pennant formation for over 12+ months. Price initially rallied from the initial bottom formation (December 2016) and established a price peak @ $54.80 (highlighted in RED). Afterward, the price has continued to rotate between support and the downward sloping resistance channel presenting traders with a very extended congestion pattern. What interests us the most about this current pattern is the length of the congested wedge pattern. We believe the upside pricing pressure that is being built up within this wedge could be 2x to 3x (or more) the pressure from the 2016 upside breakout. 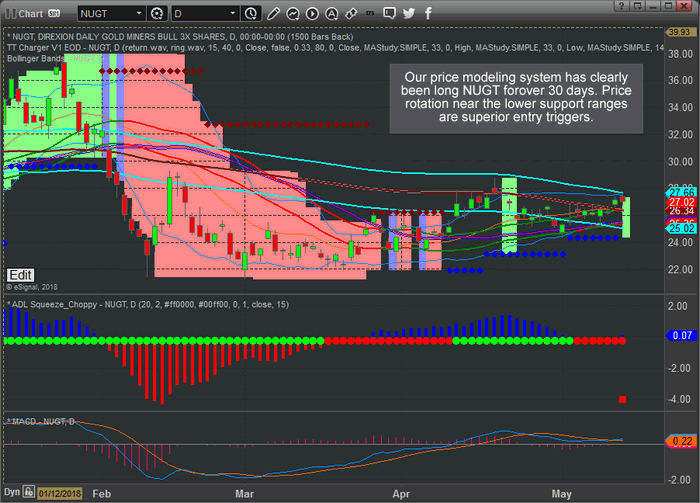 This would indicate that NUGT could rally well past the $100~140 level when this breaks – again a 500%+ price advance. 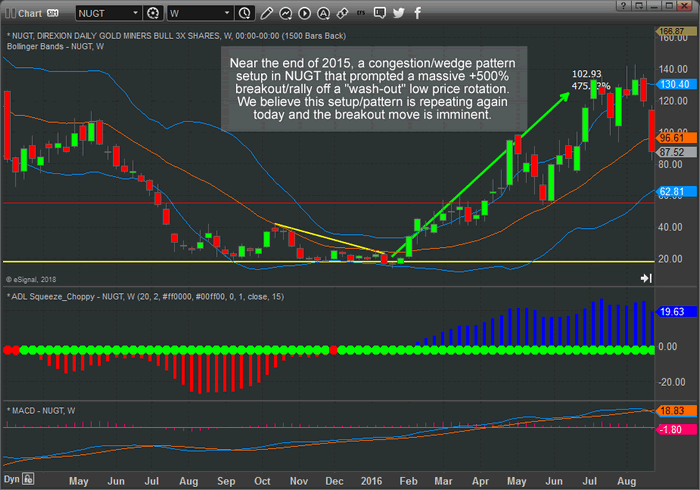 This Daily NUGT chart shows one of our price modeling systems and shows it has clearly indicated a new bullish trend began on April 10. Lower price support is currently near $24 and ultimate support is near $22. You can see from this modeling system chart that any upside breakout above the CYAN Standard Deviation channel would be very positive within this bullish trend and likely prompt a further upside price rally. 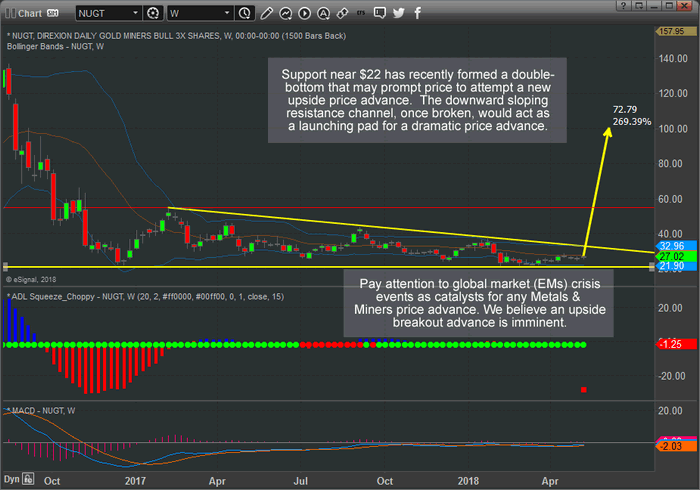 Clearly, any chance at a new trade entry near or below $24.50 is acceptable with risk near $2 per share. Remember, if this breakout/rally happens as we expect, a “wash-out” price rotation may precede this move where stops need to be soft in nature. Support is near $22, but the “wash-out” price rotation may attempt to test price levels below $22 before the massive upside rally begins. So be aware that the smart play is to understand the risk of this trade and play it knowing a “wash-out” price rotation may happen as price breaks these channels. It is not often that the markets provide traders with these types of setups. These are the type of trades that can make 400~500% or more on a single trade over 4~6 months. We focus on finding opportunities for our members and delivering success for them every month. Members to our Wealth Building Newsletter have already been alerted to this trade setup, and others and will know when a position should be initiated. If you’ve been following our research and analysis and find it valuable, please visit www.TheTechnicalTraders.com to support our research team and become a valued member. The markets are full of incredible opportunities like this and we focus on delivering critical market research, analysis, Daily video content, detailed trade triggers and continued support for our members. We know you will not find anything like our proprietary price modeling systems and adaptive predictive modeling systems anywhere else.